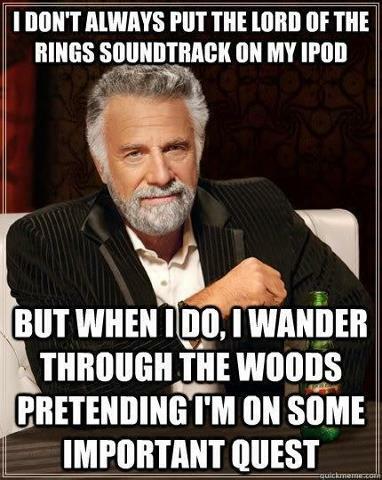 Most of my music is Lord of the Rings related, so I can totally relate! Sorry I haven’t been on for a while. My computer was getting fixed. 😛 At least I’m back now and I have just gone on a Lord of the Rings memes Google search! My own little adventure! Enjoy! What is The Hobbit? Just some top quality entertainment, right? Wrong! Now that The Hobbit is out in theaters, here’s a little something to reminisce on the movies that started it all! Peter Jackson’s Lord of the Rings has been called a lot of great things over the years. But behind all those accolades, it’s easy to forget that it can be a little pretentious at times—and a little melodramatic at others. Luckily, the guys at Honest Trailers are here to break it all down. In a recent interview with Flicks and Bits, Cate Blanchett talked about her disappointingly brief time on the set of The Lord of the Rings trilogy and how it essentially led her to “become a stalker” when rumors of The Hobbit began to surface! We’re all dressed up and pretending, creating this world – and that’s the wonderful thing about it. That’s why you do it, you try to illuminate another reality, or illuminate another internal reality for a particular person or a group of people, create a whole new world. And in this sense it’s a really fantastical world, which has repercussions for who we are as people, even though they’re elves and dwarves and hobbits, there’s obvious parallels between the world which we inhabit and in which these characters inhabit. That’s a delight, it’s why we do it. For me this Middle-earth world is so interesting. Joe Letteri, the Visual FX Supervisor of The Lord of the Rings Trilogy as well as The Hobbit trilogy is talking about the unique challenges provided by The Hobbit films in a new interview with Coming Soon! This interview contains minor spoilers! CS: I spoke to Andy Serkis earlier and I asked him about the goblin cavern scene specifically because I thought that might be hundreds of extras running around, but a lot of it was constructed based on what they did on set. Letteri: Yeah, we did some small pieces of the set that the guys could run around on and do some of the action especially that bit where they’re brought before the Goblin King because a bit of the action happens on that well-lit platform in front of the throne but most of what you see in there is digital. In fact, a lot of what was shot, we wound up replacing, just because of the complexity of the camera moves and the stereo. We shot goblins with partial suits on, but we were going to be adding their heads. A lot of what we were really doing that for was for a couple shots where it was practical. Most of the time it was easier to just replace them with completely digital characters then to try to match heads onto partial bodies. Sometimes we ended up just replacing everything that shot including the actors, because it was just easier to construct the big shots that way. Yeah, we’ve gotten to the point where we can make characters and digital doubles. As long as you’re not talking about nuanced emotional dialogue performances, you’re talking about action scenes, sometimes it’s just easier to go all digital with it. CS: I also wondered about the dwarves. In the previous movies, you had a way of turning full size actors into hobbits and you used some on-set trickery to do that, but here, you were shooting 3D and you had 12 dwarves played by 12 actors of different sizes. So wouldn’t that make every shot an FX shot because you had to make them look dwarfish? Letteri: Yeah, for the most part. There were a couple of shots where you could just get away with putting Gandalf up on an apple box or having the dwarves down on their knees. As long as you maintained a fairly correct perspective spatially because stereo obviously picked up the difference, you can get away with that, but when you go wide or when the camera started moving, that’s when you really needed to go in and look at either rotoscoping Gandalf off of the plate and you scale him up and lock him back in 3D or you replace him with a 3D character all together, like a digital double, or you go with this dynamic forced perspective using synchronized motion control rigs. What is it with all these British actors?! Why are they so good? Why do they have such amazing voices and characters? I don’t know, but hey, I don’t think I can complain about it. Now, I’m not saying there aren’t amazing actors in other parts of the world. We definitely had some great ones that have graced the screen about 10 or so years ago in the little film trilogy, The Lord of the Rings. Viggo Mortenson, Elijah Wood, Sean Astin, and Liv Tyler are all from the U.S. The lovely Cate Blanchett is from Australia. Billy Boyd is from Scotland. All great actors who played their parts quite well. But still, there’s just something about those Brits. Which brings me to the casting of 2 characters of the upcoming film, The Hobbit. First off, we have Martin Freeman, whose credits include a number of comedies such as Love Actually, Shaun of the Dead, Hot Fuzz, and my personal favorite of his, The Hitchhiker’s Guide to the Galaxy. In case you didn’t know already, Martin will be playing the lead, Bilbo Baggins. Then we have Benedict Cumberbatch, whose credits include Atonement, and 2011’s Tinker, Tailor, Soldier, Spy and War Horse. He won’t be “seen” in The Hobbit, but his role is quite vital as he’ll be voicing the dragon Smaug. It almost seems fitting that they would be playing two well known characters in Tolkien’s masterpiece story, albeit enemies, but it works. Not only that, I had to remind myself how exactly Benedict Cumberbatch’s voice sounded like, so I pulled up a clip of the Sherlock series. 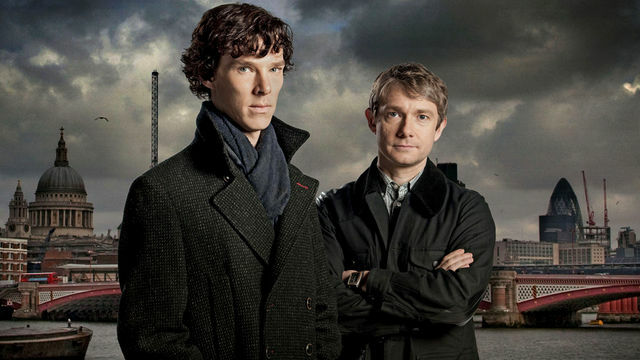 The following clip is from when Bilb-, er, I mean Watson meets Holmes for the first time. It’s a fantastic, witty, humorous scene, and I can’t wait to watch and listen to them both on the big screen when the movie comes out. So, what do you think? Does this get you even more excited about the 2 movies? I know it has certainly peaked my interest more in what Smaug will look like with that voice! More kudos for Mr. Jackson! For more on what it was like for Benedict Cumberbatch on the filming of The Hobbit, you can check out this TotalFilm article.